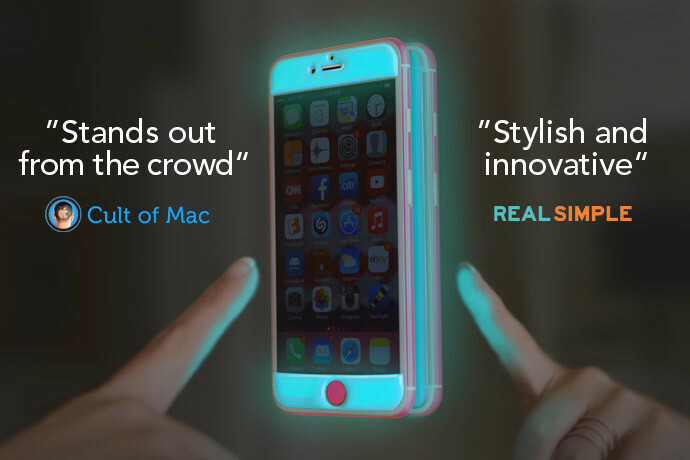 The world’s longest glowing phone case, patented “Glow Gels” perform additional awe-inspiring feats such as stick to smooth vertical surfaces, protect against extreme impact, and offer custom color-blocking that is guaranteed to turn heads. Glow Gel cases capture and retain light better than any other glow-in-the-dark material ever created. Recharges instantly when exposed to any light source allowing you find your phone in purses, backpacks, or in the middle of the night when you need it most. Glow Gel cases’ advanced traction technology prevent phone slips and falls. Magically sticks to smooth surfaces such as glass and mirrors. Perfect for taking “hands free” videos and selfies or just to impress your friends. Each Glow Gel case offered on Indigogo comes with a premium neon vinyl rim skin that works together with your Glow Gel case to create a stunning color combination.